Kids coats and jackets are needed throughout the year, with rain in spring and summer, and colder weather in fall and winter. Stock up on winter jackets, lightweight jackets, and cold weather accessories so you're prepared for whatever weather lies ahead. Here at JCPenney we have all the sizes you could need like toddler 2T-5T, preschool 4-7x, and big kid sizes 7-20. 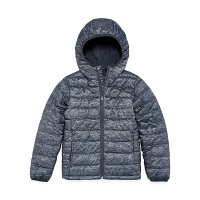 We carry outerwear from brands such as Columbia, Wippete, iXtreme, S Rothschild, and Pink Platinum. Whether your child is a toddler, a big kid, or somewhere in between, we have just what you're looking for. Boys and girls of all ages won't mind the rain so much when they leave the house with a proper raincoat. Depending on the brand, you can choose a coat that's made with polyester for a more subdued look or you can go for the traditional shiny vinyl raincoat. Get a solid color like yellow or navy or try a fun pattern; girls can get red ladybug coats, and boys can go with a firefighter-style coat. Is your child a movie fan? If so, take a look at the coats with Disney characters from Frozen, Moana, and Cars. For something really cute, you may want to try one of the trench raincoats for girls. They have ruffles at the bottom and come in colors like pink and khaki. Some places in summer can get a bit chilly on overcast days and at night. A lightweight coat or windbreaker is great for a day like that; it won't overheat your kids, but the polyester shell will keep the wind at bay. Add some flair to your girl's wardrobe with the on trend denim jacket, or they can stay warm with an anorak, which is versatile enough to also keep out the rain. We also carry fleece jackets for boys and girls in colors such as black, blue, and grey. Grab a pair of gloves, a scarf, and hat for those extra chilly days. Stop by a JCPenney store or keep browsing our website; we have plenty of kids coats and jackets to choose from! Thick down coats are perfect for a day out in the snow building snowmen, tobogganing, and sledding. This is because down is one of the best insulators around, but if your kids have allergies, it poses a huge problem. We want our customers to have as many options as possible, so we have jackets that use synthetic materials in place of down. Alt-down coats are wonderfully warm! If you kids love winter sports, we have an amazing selection of jackets just for winiter sports, such as skiing and snowboarding. Our winter jackets for boys and girls have snaps, buttons, zippers, hook and loop fasteners, and more! Find the right coat that your child can easily put on and secure themselves. They also come in cool colors and designs.